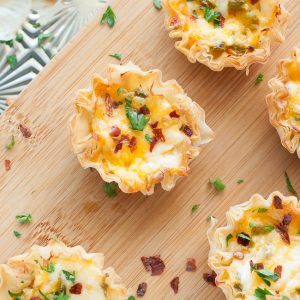 Easy to make and even easier to eat, these baked jalapeño popper phyllo cups are the ultimate appetizer! Everyone is sure to adore this jazzed up, bite-sized, crowd-pleasing recipe! Prepare a baking sheet by lining with foil and spritzing with a little olive or oil to prevent sticking. Feel free to use a silicone baking mat or parchment paper instead. All will work. Arrange phyllo cups on your baking sheet and set aside. Combine greek yogurt and softened cream cheese in a bowl. Spoon mixture into cups and bake for approx 13 minutes or until crispy and melty. Feel free to switch the oven or toaster oven to broil for a minute or so for a golden topping! I may or may not have eaten a few before popping them in the oven. Holy yum! They're actually great chilled too! Yes I was so desperate as to try them every which way. I'll eat them upside down if I have to! SO GOOD! Craving an extra kick? Top with some zesty red pepper flakes. You can also garnish with fresh sliced (or pickled!) jalapeno slices! Yum! Habanero cheddar and Jalapeno cheddar cheeses work great as well as the Pepper Jack cheese - Choose your favorite! Need a smaller serving? Feel free to halve the recipe or simply make the full amount and freeze the leftovers! You can also simply fill as many fillo shells as you need, then save the remainder of the filling for a delish dip to snack on later. Leftovers will keep in the fridge for 3-4 days and taste great! Need a make-ahead appetizer? This one has your back! For best results prepare the filling and refrigerate for up to 48 hours in advance. Then simply fill the cups and bake to bubbly perfection! Need to shave even more time? You can fill the shells before popping them in the fridge then bake when you're ready to nosh the following day.